Rich vegan chocolate mousse recipe that’s made with coconut milk that takes minutes to make. It’s thick, rich, creamy, dairy-free and suitable for vegan, paleo and refined sugar-free diets. Made from just 6 ingredients that you probably have already in your cupboards. 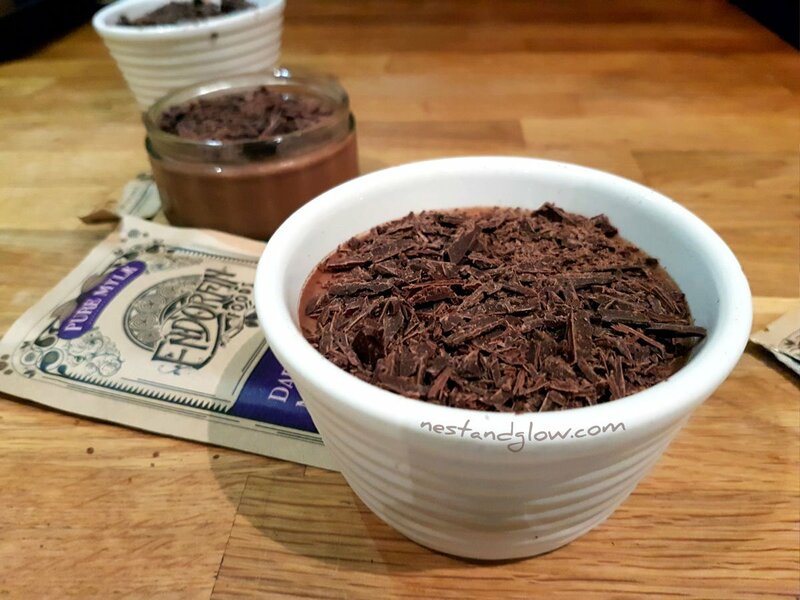 A very easy no-cook dairy-free chocolate mousse recipe using heart healthy coconut fats to naturally set this dessert. Coconut milk is made using the white meat of the mature coconut. Coconut meat is usually shredded, soaked in water, blended and filtered to make milk. This removes most of the fibre but retains the fat of the coconut. If you are feeling adventurous you can make your own coconut milk using the instructions in my golden tempeh curry. While saying in Bali I discovered that locals do not buy coconut milk – they made it. Luckily I travelled with a mini blender and the kitchen where I was staying had a strainer so I was able to make fresh coconut milk. Fresh coconut milk is more nutritious as pasteurising and canning does result in a lower amount of goodness in coconut milk. Fresh coconut milk might not set as firm as tinned in this chocolate mousse. However if you use just a small amount of water to make fresh coconut milk it should still set firm enough when left overnight in the fridge. For the photos/video of this chocolate mousse, we used 85% dark chocolate roughly chopped and sprinkled on top. You can use any type of chocolate you prefer but I usually use a very dark chocolate as the bitter taste blends really well with this smooth creamy dessert. Plus very dark chocolate is vegan, low sugar, dairy free and high in antioxidants. Do always check your dark chocolate to make sure its vegan as some cheaper brands add butter oil as a cheap replacement for cacao butter. Berries also work very well topped on this dairy free chocolate mousse such as raspberries, Incan berries and strawberries. Incan berries are otherwise known as cape gooseberries, golden berries, Peru cherries and physalis peruviana to name just a few! 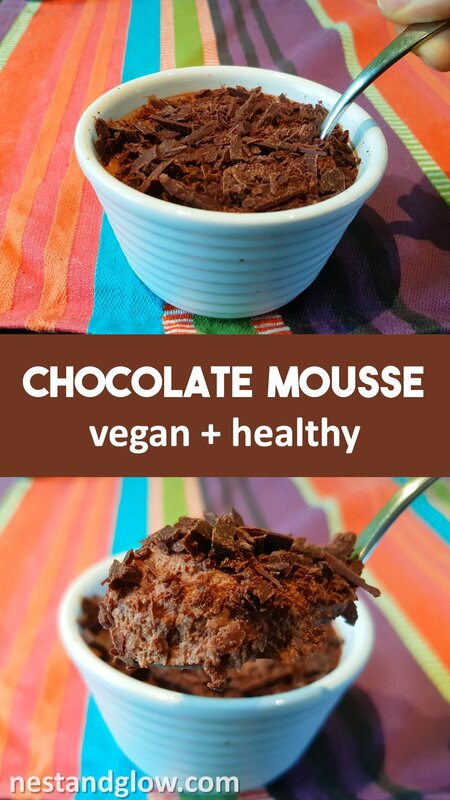 I’ve always made this vegan chocolate mousse with full-fat coconut milk, this is creamy enough to make the mouse set just like a traditional mouse. With low-fat coconut milk, the cacao mousse won’t set so I recommend to only use full fat. When making coconut chocolate mousse do check that your coconut milk is high in coconut. Some brands are as low as 30% coconut and others are 60% or more. Aim to get a brand that is at least 60% coconut. 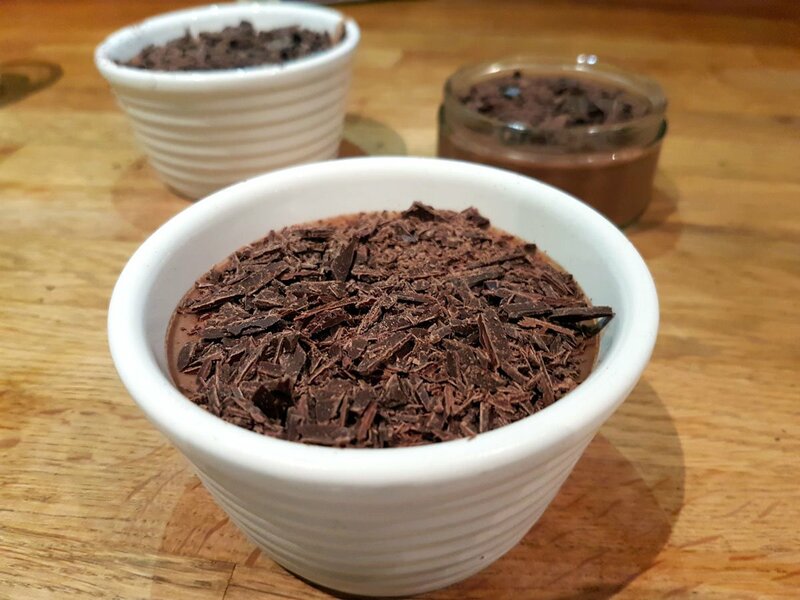 If you are looking to reduce your fat amount, although coconut fat is healthy and fat is not the enemy, just make a smaller version of this chocolate coconut mousse. As always I use heaped tablespoons for dry ingredients, so this mousse recipe calls for 4 heaped tablespoons of cocoa/cacao. This is technically the same ingredient as cacao is just Spanish for cocoa but most times raw cocoa is branded as cacao. Meaning cacao is often shorthand to mean raw. I like to use raw cacao powder as its higher in antioxidants and has not been treated with an alkali. As with all of my recipes, this is designed to be simple and easy to make. Don’t feel limited by the ingredients here and add anything else you like! I think that cayenne pepper is a great addition to this chocolate mousse to give it a kick and bring out the deep chocolate flavour. If you add anything extra please comment below or tag me on social media @nestandglow to share! Big thanks to my friend Randy who gave me the chocolate mousse recipe and made the mousse in the video, while I stood on a chair with my phone recording. That’s why the quality of the chocolate mousse video isn’t quite the same as my other recipes! Shake the coconut milk and open the tins. Pour into a bowl and whisk until it’s all combined. Add the cocoa/cacao, salt, vanilla and whisk while adding the sweetener. It will still be pourable, see the video for consistency, but will set in the fridge. Pour mousse mixture into your serving dishes and place in the fridge for at least two hours. Finely chop the chocolate, sprinkle on top and serve. The vegan chocolate mousse will last a few days in the fridge. 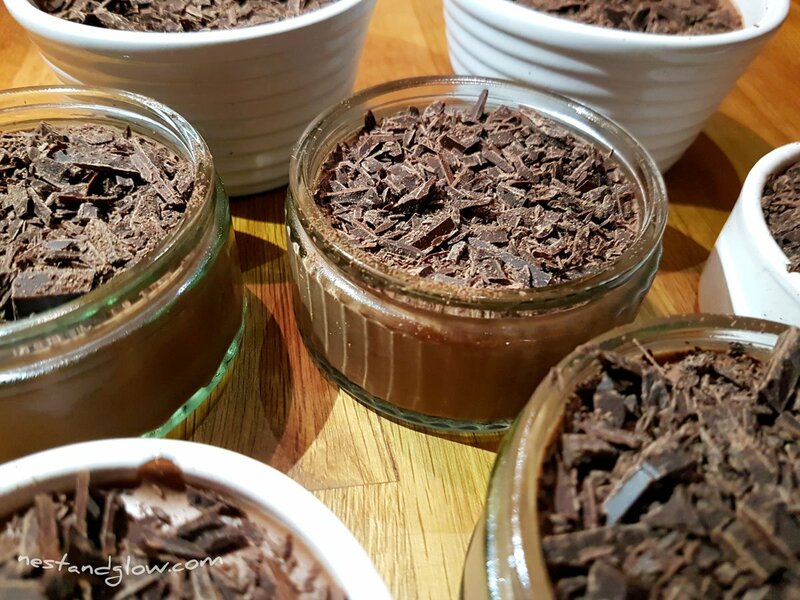 If you like this recipe check out my “Nutella” chocolate hazelnut mousse – it’s very similar to this recipe apart from hazelnuts are added to make it a healthy vegan take on Nutella. This was amazing, I thought it looked to simple to be true! But it worked perfectly, this will become a staple in my kitchen from now on. Thanks! Can I make this in a nutribullet? I would solidify the coconut milk first, save the water to make a simple syrup and whip the heck out of the solid milk then add all the rest. So good! Where did you get those jars? I really like them. Help! I followed the recipe and my mousse didn’t set. I used pride coconut milk in a can – not a low fat option. What has gone wrong? how long will it last frozen? Wondering if i can squish it into pouches and send with school lunches as a substitute for pudding! Hoping to freeze pouches and pull out the night before as needed. how long can it last outof the fridge tho? The ingredient list says 1 can of coconut milk and the video says 2 cans. Which is correct? Hi, can I make this with coconut cream instead? Hello Deb, it does depend on your coconut cream as it varies in different countries. Is your coconut cream pretty thick when it’s chilled? Is it from a can? Yes, it is pretty thick and comes in a can. I am making this for my dairy free, gluten free friend today. Just worried that it may not set well. I’ll get the milk without stabilisers, if I don’t get them I’ll have to use the cream version I think. Will send you pictures. Thank you for the recipe. ???? I haven’t been able to find any coconut milk that tells the amount of coconut yet. Is there a way for me to tell from the fat % on the nutrition facts? Or can you suggest a brand to me? Oh no sorry to hear that, are you in Europe? It’s listed on all the brands in the UK like this – Coconut Extract (75%), Water, etc but it might be different in other places. What I recommend to do is shake the can, if it’s got lumps / solid parts you should be good to go. If it sounds like one consistent liquid I would suggest not using it for this recipe. Do you have the Nuritional Facts for this recipe? WOW! Okay so as someone not vegan (but trying!) this was amazing! i recommend popping it in the freezer and you get an amazing fudgesicle like ice cream! i’m addicted!! Thanks, that’s great to hear! This site is all about encouraging more plant foods into peoples diets. Agree it works really well frozen as an ice cream lolly! Sooooo I just tried this using Trader Joe’s (an American store) organic coconut milk. It stayed liquid and the fat parts never quite lost their crumbly quality even when mixed by hand, with an electric mixer then finally a blender. I finally added chia seeds, blended again, and refrigerated for 4 hours—still liquidy with the fat parts separated and on top. My solution? Throw in some milled flax seed, heat it up on the stove and have some tasty hot chocolate 😁. What I may do in the future: try a different coconut milk brand and/or heat everything up to distribute the milk fat then refrigerate. That last one will add time, but it might be worth a try. I’ll update when I try either! Regardless if this is hot or cold, this is delightful! Thank you so much for the recipe! FYI This is not a quick dessert people!.. after 8+ hours I still have liquid. Trying the freezer now… but I suggest you take the words “takes minutes to make” out of the description! The setting time needs to be included not just the mixing of ingredients time!!! I tried this last night and it came out really runny after whisking by hand, with an electric hand mixer, in blender, and finally adding chia seeds. The milk fat was still in pieces, but I put it in the fridge anyway. A few hours later it was still runny with the milk fat hanging out on top. Solution? Added a spoonfull of milled flaxseed, heated it up and made delightfully creamy hot chocolate! Next time I’ll try coconut cream and see if it comes out thicker, either way it was amazing! Thanks for the recipe! Ah sorry about that – coconut varies so much. But great that you knew there was no waste to be had – that’s exactly what I do when something chocolate doesn’t turn out – make it into a hot chocolate! My mousse mixture came out super lumpy. Not sure what I did wrong but it’s just not mixing well and I followed the recipe to the dot. Hi there, coconut milk does vary so so much! If it’s lumpy I would mix a bit more to melt it and combine. What were you using to mix?